5 FT X 25 FT Sports Barrier & Containment Netting, New Commercial nylon net 4 inch diamond TWO inch hole. About 150 pound test. 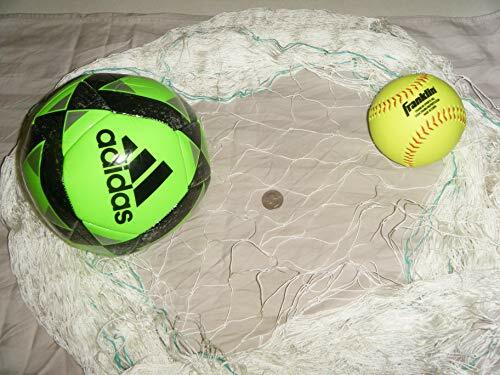 A softball will not fit thru the mesh. Will work for Soccer, Softball, volleyball and other sports. Will hold up to heat, snow and strong winds. You can color it with rit dye. Cut as you like the knots will not unravel. Keeps balls out of neighbor's yards or through their windows. Stronger than bird netting. All orders are cut at time of sale. Do not use where personal safety is involved. Please follow instructions on how to hang the net so it will not be short in the center. If your net is short in the center you have the meshes pulled to tight left to right. Slide some mesh back towards the center and the center of net will drop down. Directions on how to hang the net in every package. 4 inch stretch thats a one inch hole. NEW Netting made of Nylon and does not rot. Cut as you like the knots do not unravel.